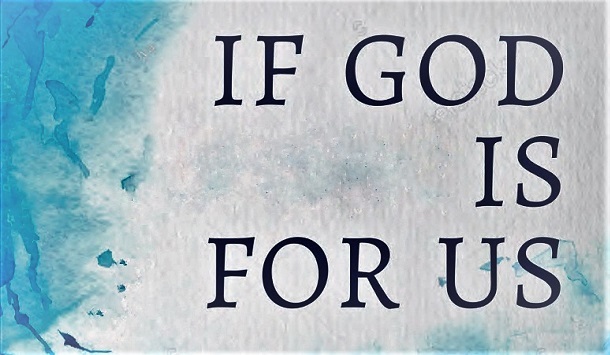 You are here: Home / Featured / 1 Peter, Lesson 3: Our Life with God: Is It Up to Us or God? In 1 Peter 1:3-12, Peter is preparing his recipients for what is to follow, to be well-disposed and ready to receive his instruction. 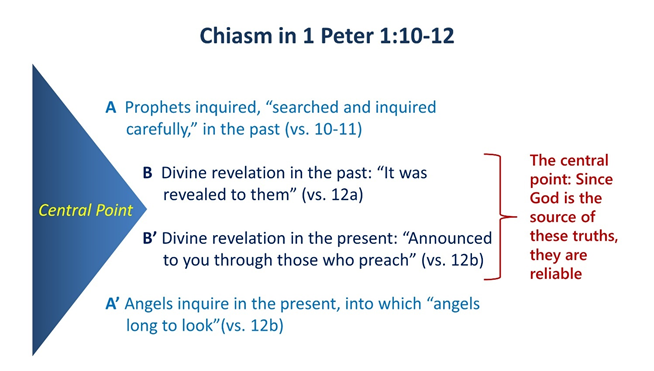 Peter does this by expounding on the activity of each Person of the Holy Trinity, offering a blessing based on the Father (vs. 3-5), Son (vs. 3, 7-8), and Spirit (vs. 10-12). God the Father, by His choice, brought Christians into a wondrous heritage (vs. 3). God the Son, Jesus, made the Father’s choice a reality by His rising from the dead (vs. 3). God the Holy Spirit works through the preached good news, announcing this truth (vs. 11-12). We now delve into the section where he focuses on the work of the Holy Spirit. Peter starts with “concerning this salvation,” which he just stated: “obtaining the outcome of your faith, the salvation of your souls.” Peter used “soul” from the Jewish understanding, as one’s entire being. What did prophets prophesy about the Messiah to come? “searched and inquired carefully”: ekzeteo and exeraunao. The Septuagint used the same two verbs in Psalm 119:2, referring to “searching” (“guarding” in the Hebrew) and “seeking” the testimonies of God with one’s whole heart. Peter is focusing on their diligence, not on the particular prophets (he simply says “prophets” not “the prophets”). To Peter, who did the prophesying doesn’t matter. What matters is prophesied grace given to the people in Peter’s day. This will become clearer in vs. 12. “the sufferings of Christ”: Peter employs unusual wording, “into Christ’s suffering” (not using the genitive form to mean “of Christ”). In the Jewish thinking of Peter’s day, the Messiah’s coming will end the messianic sufferings and usher in the glories to follow. Peter turns this thinking on its head: As God’s people of old suffered before the Messiah’s coming, the “grace that was to be yours” may include being brought “into Christ’s suffering” yourself. These sufferings may take place for the Christian before “the subsequent glories” (ultimately meaning Christ’s return). If salvation is because of Christ, why does Peter use “glories” as if this includes many events? Whom were these prophets of old serving? How? As the sufferings of Jesus were followed by glories (1:11), His resurrection and return on the Last Day, those who suffer because of Christ will also find glories when He appears. With this thought, Peter moves forward, now using his first imperative (command), which concerns this salvation: hope. Peter breaks this section into three subsections. and the call to be God’s priestly people in the new temple (2:1-10). “preparing your”: “girding your loins” in the Greek. This involved pulling up your robes and tying them around the waist to prepare yourself for action. The Israelites ate the first Passover with “with your loins girded, your sandals on your feet, and your staff in your hand. And you shall eat it in haste” (Exodus 12:11). The imagery is the Christian lives waiting for his liberation, in this case, on the Last Day. What is the motivation for living the Christian life? 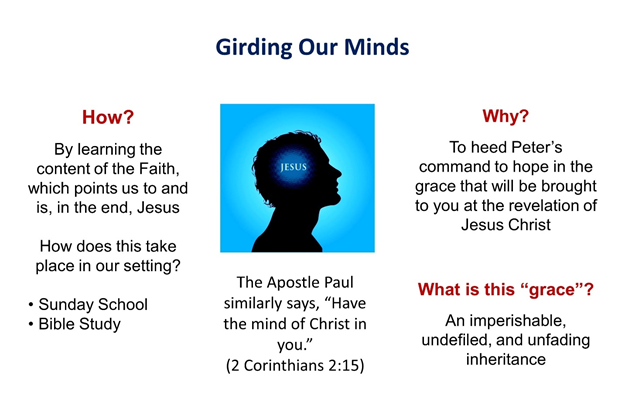 “preparing your minds for action”: “girding your loins, your minds.” Here, Peter uses the Greek word dianoia, which includes: thought as a function, 2) the power of thought, the thinking consciousness, 3) the way of thought, 4) the result of thought. “set your hope fully”: This is the first imperative, command, in 1 Peter: Hope, but also how, “fully.” By this, Peter is denoting that hope is not simply one quality among many for the Christian, but is a comprehensive term which summarizes our existence. Peter now writes how someone “girding” and “sobering” his mind, who “hopes” in Christ, lives. He will quote from Leviticus 19:2 where God admonished His Old-Covenant people to live differently than their Gentile neighbors. If Peter is writing mostly to those of Jewish origin, what would have been the passions of their former ignorance? “be holy”: An imperative, but aorist (the closest thing in the Greek to being a past tense). So, this doesn’t mean make yourself holy as if they are not already so, but “show yourselves as holy.” Peter’s application of the Old Testament shows us two things. How then do Christians show themselves as holy because of the link Peter makes? Perhaps, this will help us better follow Peter’s flow of thinking. The holiness of the Christian it is rooted in the character of the Father and His holiness. Though we are to live holy lives, our holiness is not derived from what we do but in whom we live. Our holiness comes from God. The ethnically Jewish Christians, in the passions of their former ignorance, believed their status before God was based on their righteousness. So, Peter bring them back to the Source, God. In this section, Peter is brief, not yet explaining what he is saying, but identifying what he is going to say. So, these few verses are the least “Asiatic” in their character. Peter begins this section with an if-then statement. Who calls on God as their Father? Like the Jews sojourned, with no permanent home in Egypt or Babylon, so Christians also have no final dwelling among the nations where they now live. Their home is in heaven (1 Peter 1:4). “impartially”: Literally, “not receiving the face of.” This means someone’s appearance or status has no bearing on the outcome. What then should Christians do? At this point, Peter is leading the recipients to this, “I better behave because God judges impartially.” This can play out a couple of different ways. The way of the Law concludes I better meet His standards because there’s no way to fool God, since He is impartial. The way of the Gospel leads us to vs. 18. Because God judges impartially, what is the only way someone is holy enough to meet God’s standards of impartiality? In 1 Peter 1:18-19, sin and its consequences are not the primary focus. No, “the futile ways inherited from your forefathers” are. The potency of their malformed, received thinking is strong, which explains why Peter will revisit this. So, if one might still think God’s impartiality demands one must meet His expectations based on who he is, Peter will attack this once more. For whose benefit was Christ “made manifest”? Peter establishes a pattern. He sets up one’s righteous standing before God by what someone does, only to tear it down by what God does. This make sense, for he’s writing to Jews who “inherited” this way of thinking (not from God) but from their forebears.